The Conversations dialog box now offers the user the ability to format plain text within a message using Markdown. This new text formatting tool, provides a richer conversation through the use of text formatting, hyperlinks, and adding images. This tool also provides a method to organize and relate information in a more understandable way. For example, text modifiers can be added to create headers, lists, and other formatting options for visual enhancement. Links can be included to help add useful and easily accessible references to other resources inside the conversation, along with the ability to attach files with relevant information. 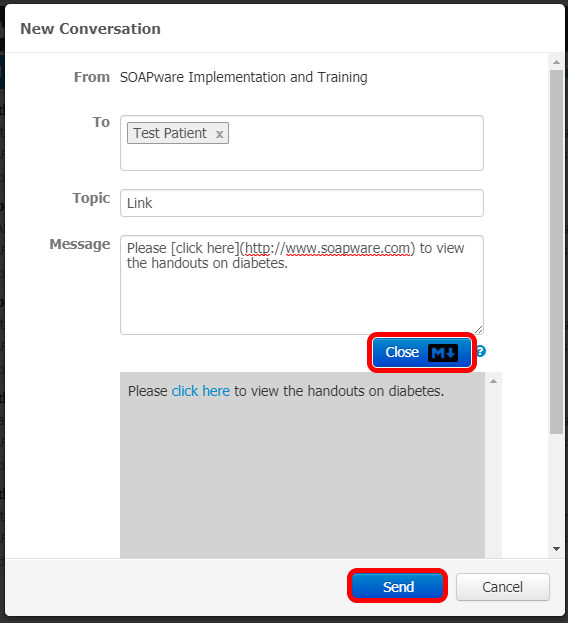 Once you have picked your recipient and entered a topic, click on the Preview button. 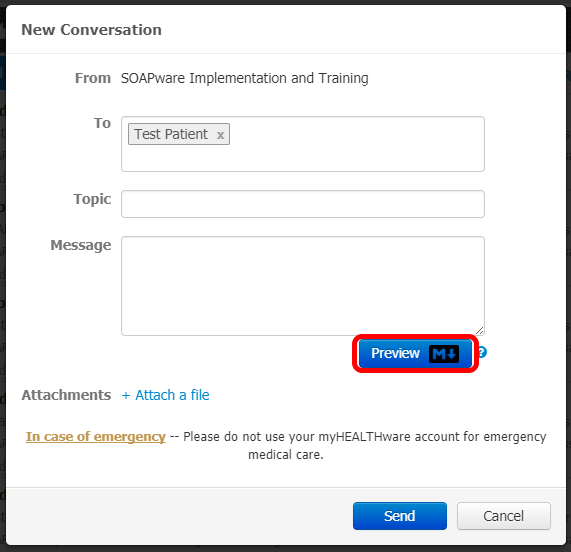 This will open a preview window where you will be able to preview the message formatting changes prior to sending the message. Let's take a look at some of the options offered by using Markdown formatting. *Note: The user will type all the text modifiers necessary to format plain text to HTML, within the Message box, however how the text will actually appear, will display within the Preview (gray) box. 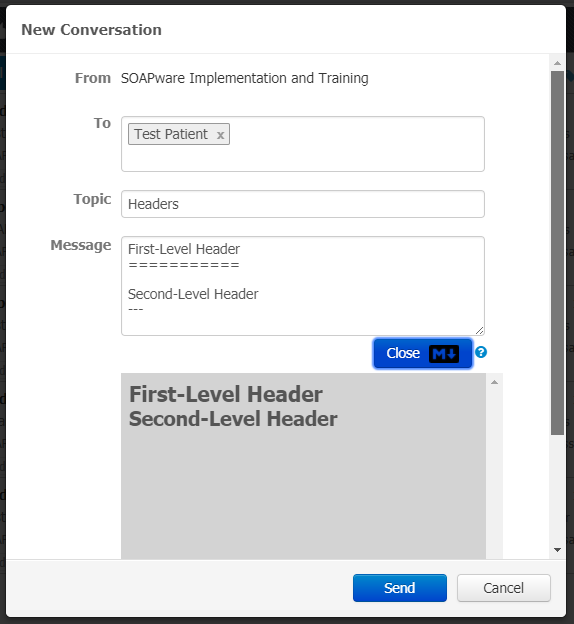 The screenshot above shows what a first-level and respectively, what a second-level header would display as. With a first-level header, type your text, hit the Enter key, and type an equal sign =. For a second-level header, type your text, hit the Enter key, and type a minus sign -. Any number of underlining =’s or -’s will format the header as shown in the screenshot above. Blockquoting using the message formatter works very similarly to blockquoting text within an email, however, you only have to place the > symbol before the first sentence if you are typing more than one. Unordered lists use asterisks, pluses, and hyphens, interchangeably, as list markers. Just remember on whichever list marker you choose, place a space between it and the text you type, followed by pressing the Enter key to go to the next line. If you would like a numbered list, simply type the number following by a period and a space then enter the desired text, as shown in the screenshot above. The message formatter treats asterisks (*) and underscores (_) as indicators of emphasis. In the screenshot above, we placed a single asterisk before and after the word, blue, to italicize the word. We then placed a double asterisk before and after the word, to make the word bold. You can use whichever style you prefer; the lone restriction is that the same character must be used to open and close an emphasis span. To create an inline link, use a set of regular parentheses immediately after the link text’s closing square bracket. Inside the parentheses, put the URL where you want the link to point. 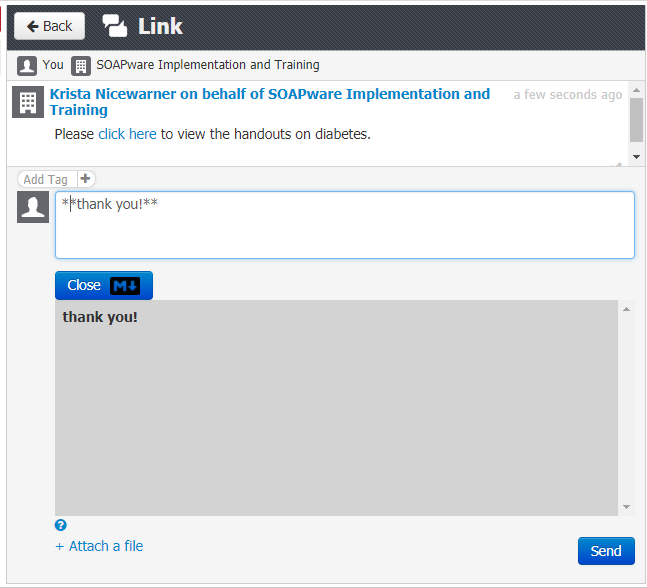 As shown in the screenshot above, to achieve an inline link within the message formatter, type the initial text, hit the spacebar, place the words you want the recipient to click on within square brackets, then with no space after the closing bracket, type the URL inside parentheses. To add an image within your message, one option is to have a path to an image for reference. Type an exclamation mark (!). Enter a set of square brackets ([ ]), containing the alt attribute text for the image. 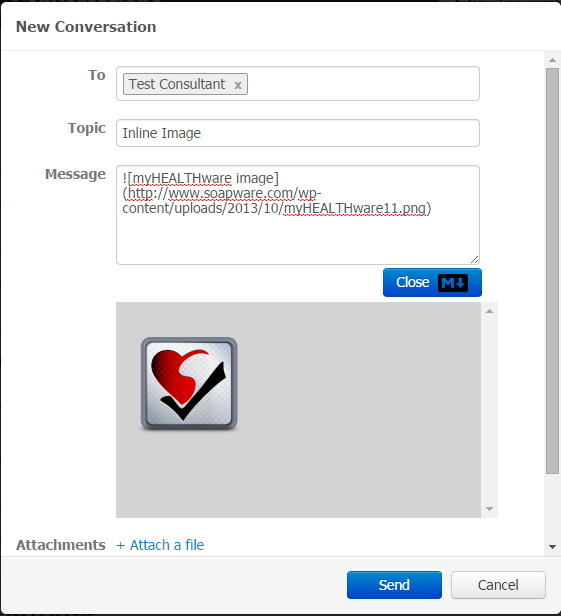 In the screenshot above, our attribute text for our image is "myHEALTHware image". Enter a set of parentheses ( ), containing the URL or path to the image. The path to our image was found by right-clicking on the image, and selecting Copy Image Location from the drop down list of options. At any point, you are able to click the Close button, in order to close the Preview box from view. Once you have made all text modifications, click the Send button for the conversation to be sent. 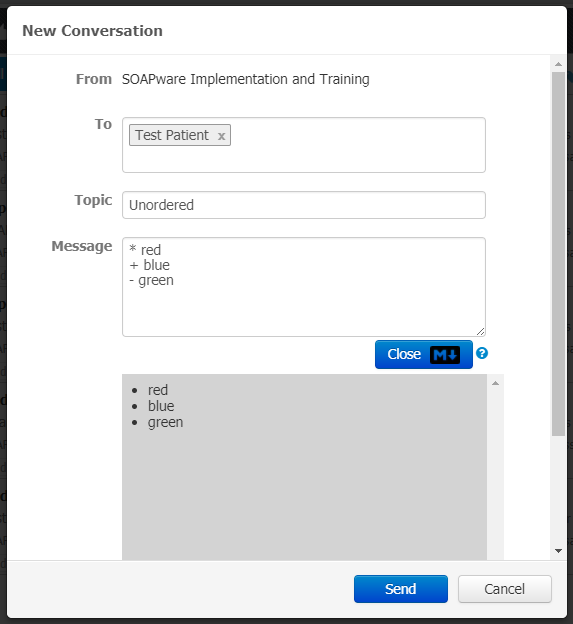 The message formatter can also be found within the reply window for a conversation.